In Spain, the end of the hunting season is just around the corner, and while Spanish game might be breathing a sigh of relief, the dogs that helped the hunters get their catch are now the ones facing a gruesome death. 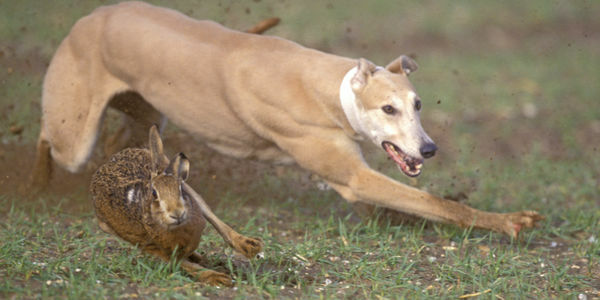 In many parts of rural Spain, galgos — the Spanish version of a greyhound — are used to hunt wild hares. Each hunter buys from 10 to 70 each to last them during the hunting season. That amounts to thousands of dogs being used for the sport. Each year, these galgos are expected to perform by catching hare — bringing pride and glory to their owner. But at the end of the season, the dogs that don't perform end up abandoned or killed. According to estimates, up to 100,000 galgos are killed each year by their owners. The dogs are either abandoned to starve to death in the forest, thrown down wells, shot or, more traditionally hung. "Good dogs" enjoy the "honor" of having a rope thrown around their neck and being hoisted from a tall tree branch. "Bad dogs" on the other hand don't get the same "courtesy" — their owners usually pick a tree branch that's just a few feet off the ground, and the dog is then strung up just high enough that its feet can't touch the ground. The poor dog struggles unable to get a footing and eventually chokes to death. The horrible spectacle of watching the dog trying to get its foot on the ground even has a name: "piano playing." While there are laws in place, that passed as recently as 2010, dogs are still killed annually in this way. According to the National Geographic, most dogs are not microchipped, and those that are are usually de-chipped before they are dispatched by their owners making them impossible to trace. The root of this rampant abuse is the fact that hare coursing — the sport of using galgos to hunt down live rabbits — is still legal in Spain. This cruel sport not only involves the torture of the wild animals, but also leads to the annual slaughter of the hunting dogs themselves. While most European countries have outlawed the sport, Spain has yet to budge, even as it recognizes the carnage that it causes and the cruelty that the galgos face. That is not OK. It is time Spain said enough and banned this cruel "sport." It's the first step to ending the annual dog massacre.